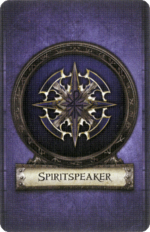 Spiritspeaker is one of the class options for the archetype Healer. This class was first introduced in the Second Edition base game. Spiritspeakers exist in harmony with the surrounding environment, able to commune with nature and the spirits. While useful as healers, they are not specialized in it like the Disciple. The Spiritspeaker is closer to a white mage, using abilities to buff up allies and discourage attackers. Starting equipment for a Spiritspeaker is an Oak Staff, and the starting skill is Stoneskin. Ancestor Spirits 3 Exhaust this card when 1 or more monsters suffer from 1 of your class skills. Each of those monsters is Poisoned. Spiritspeaker starting weapon Oak Staff. Spiritspeaker skill Cloud of Mist.